Ai is the word for Love in Chinese, the exact emotion this stone evoked during last week’s auction. This breathtaking 5.00 carat, emerald cut, VS2, Fancy Vivid Blue diamond acted as the centerpiece of this year’s autumn sale and managed to yield a very respectable $13.8 million. Despite high saturation being a good thing in colored diamonds, too much can actually cause a stone to lose its vibrancy and translucency; this was exactly the case for the “Ai.” The stone is saturated to the point where it actually looks Fancy “Deep,” rather than Fancy Vivid as stated by its GIA Certificate. Having said that, the diamond still managed to perform exceptionally well, yielding close to $2.8 million per carat. Next on our list is a beautiful 3.47 carat, pear cut, VS1, Fancy Intense Blue diamond. 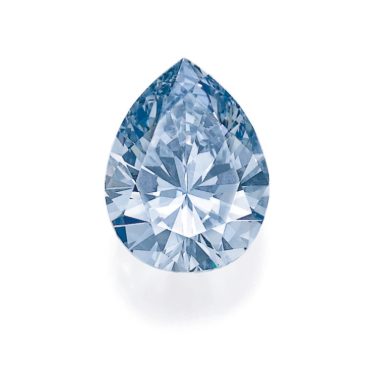 The stone was possibly cut during the end of the 20th century, as indicated by its shape resembling that of a wide colorless brilliant diamond. 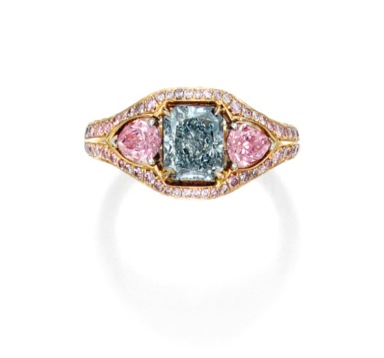 Such polishing techniques, when applied to fancy colored diamonds, results in the stone having colorless patches, which hinder the diamond’s full potential of illustrating its color. As seen in the image above, most of the color is located at the point of the pear shape, leaving most of the stone quite pail. This, coupled with the fact that the diamond exhibits a gray undertone can result in price discounts. Nevertheless, the diamond still managed to yield $886,671 per carat, which was close to its high, pre-auction estimate of $1 million. The next stone on our list is truly a rare one, exhibiting a truly remarkable combination of hues. 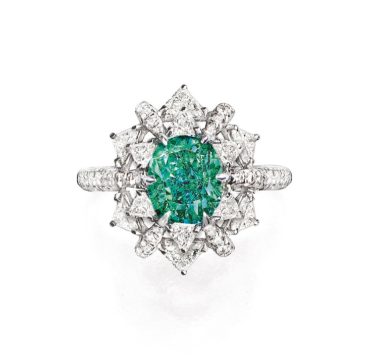 We are, of course, referring to lot 1748 which featured a 1.38 carat, SI1, cushion cut, Fancy Vivid Bluish Green diamond. The stone has a clear and attractive undertone alongside a strong ‘Inner-Grade’ with very few colorless patches. 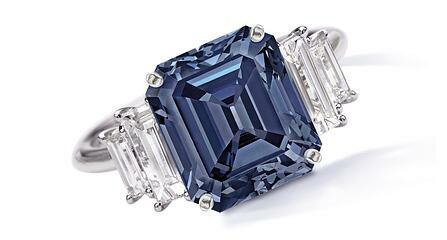 All of the above was enough to make the stone sell for a quite respectable $587,886 per carat. The only internally flawless (IF) diamond to appear on our list was this breathtaking 1.42 carat, Fancy Intense Blue, with no traces of a gray undertone. The stone can be seen with a solid Inner Grade and a colorless frame around the table. The sheer quality of this stone was enough to make it yield $528,206 per carat, slightly shy of its $538,310 per carat, high, pre-auction estimate. A gem truly worthy of its price. 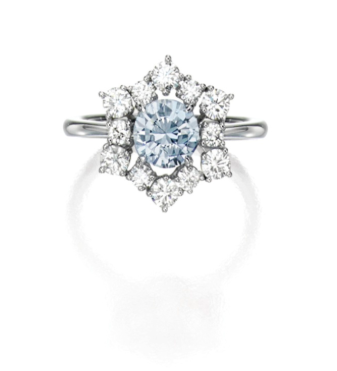 By far the smallest diamond on our list is this 0.87 carat, SI1, Fancy Blue. Despite the stone being a brilliant shape, it is cut in a rather unusual way, exhibiting 70% table and 56% depth. 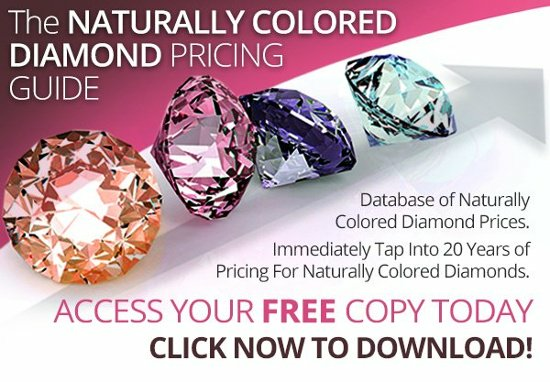 These proportions actually work against a diamond’s natural beauty, as it hinders color dispersion. 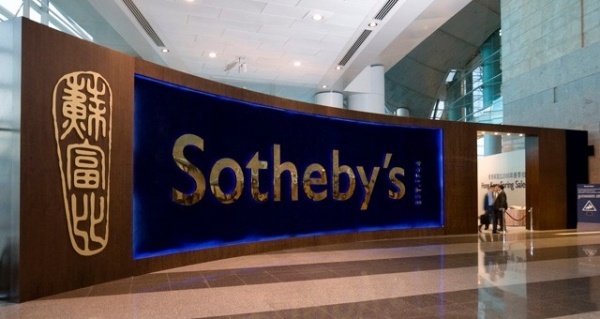 Nevertheless, the stone managed to exceed expectations, selling for $265,751 per carat; far beyond its high, pre-auction estimate of $95,184 per carat. 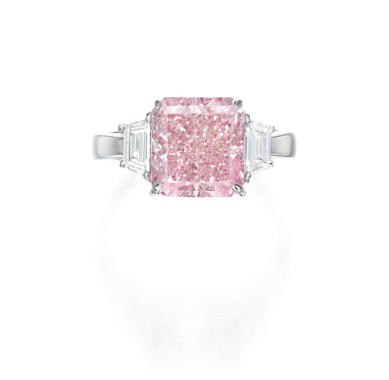 The final stone on our top 5 list is a 4.31 carat, radiant cut, Fancy Intense Purplish Pink. Despite the stone having multiple inclusions, visible to the naked eye, and a strong blue fluorescence under UV lighting; it has a very pleasant “sweet” and “cold” undertone, with very few colorless patches. The latter was probably its most redeeming factor (that, and it’s very rare combination of hues,) and was ultimately sold for $234,403 per carat. This was a fair bit under its high, pre-auction estimate of $295,592 per carat, but still respectable for a diamond with such characteristics. And there you have it. Did you see any diamond that stood out during the auction? Do you have any questions regarding colored diamonds as investments? Let us know! And as always feel free to follow us on Twitter and like us on Facebook.